Faults can move horizontally to the left or right and/or vertically, and the rake of a fault results from a combination of vertical (dip) and horizontal vectors. Rake = angular slip direction of hanging wall block measured in the fault plane and from the dip vector. Net-slip comprises dip vector component and horizontal vector components. a. net-slip = total slip of fault. b. dip-slip = dip-parallel slip component. c. strike-slip = strike-parallel slip component. d. vertical-throw = vertical component of net-slip. e. horizontal-throw = horizontal component of net-slip. f. heave = stratigraphic heave = apparent horizontal component of the net-slip. 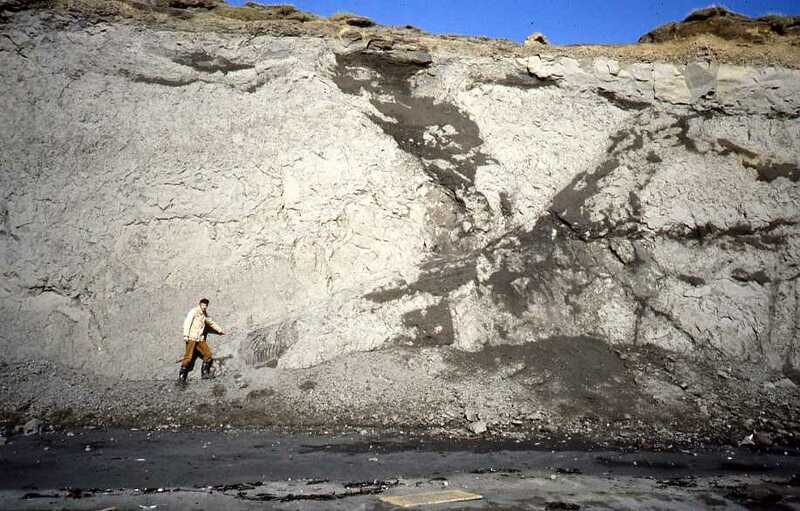 Vertical throw, which is the vertical component of net-slip, is different for dipping strata than stratigraphic throw, which is the vertical offset of faulted strata. If the hanging wall, which lies above the fault, moves downward relative to the footwall, then the fault (as in diagram) is a normal fault. A detachment fault is a regional, low-angle, listric normal fault formed during crustal extension. Listric faults are curved normal faults in which the fault surface in concave upwards because the main detachment fracture following a curved path rather than a planar path. Slumps are listric faults. 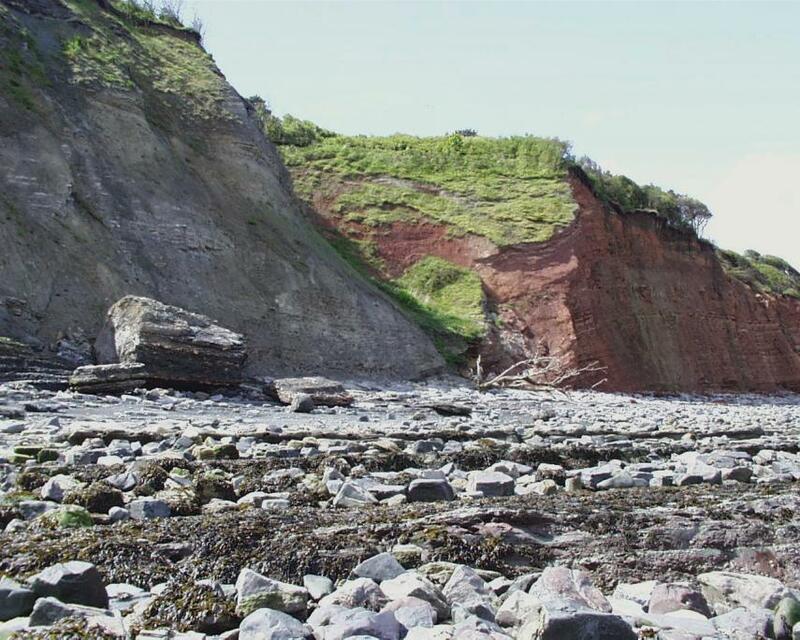 Crustal extension stresses create sunken graben blocks bounded by parallel normal faults and lying between horst blocks that lie higher than the sunken graben blocks. Compressional forces during orogenies can elevate horst blocks. If the hanging wall is thrust upward above the footwall, then the fault is a reverse fault. 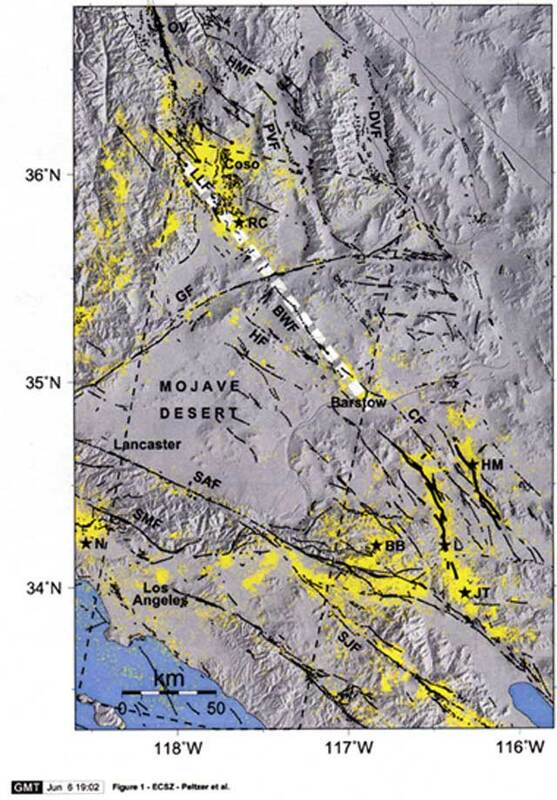 A thrust fault is the special case of low dip-angle faults that formed during regional compressional deformation. If the predominant movement is in the horizontal direction, then the fault is a strike-slip fault (transform fault or wrench fault). The term tear fault can be used to indicate a steeply-dipping wrench fault that bounds or cuts the hanging wall of a thrust or normal fault (also used for mode III faults). Folding buckles strata away from the linear, planar, and horizontal. Folds may be symmetrical or asymmetrical. In a symmetrical fold (image at left), the axial plane is vertical and the limbs (sides) dip symmetrically from the axis. In an asymmetrical fold, the axial plane is tilted from the vertical with one limb dipping more steeply than the other. ▪ the axial plane of a fold is an imaginary plane surface that divides a fold as symmetrically as possible. ▪ the fold axis is a line drawn along the points of maximum curvature of a layer of a fold (parallel to the hinge in anticlines and synclines). ▪ the plunge of a fold is the angle between the horizontal plane and the fold axis (when this is not not horizontal). Monoclinal folding drapes strata as though over a ledge, whereas hinge folding wraps the limbs of a fold as though hinged around the fold axis. Because the eroded surface of a plain could fail to indicate the sub-surface folding relationships of ridges of resistant strata, folding is most easily elucidated by examining structures eroded through folds (side view of diagram at left). 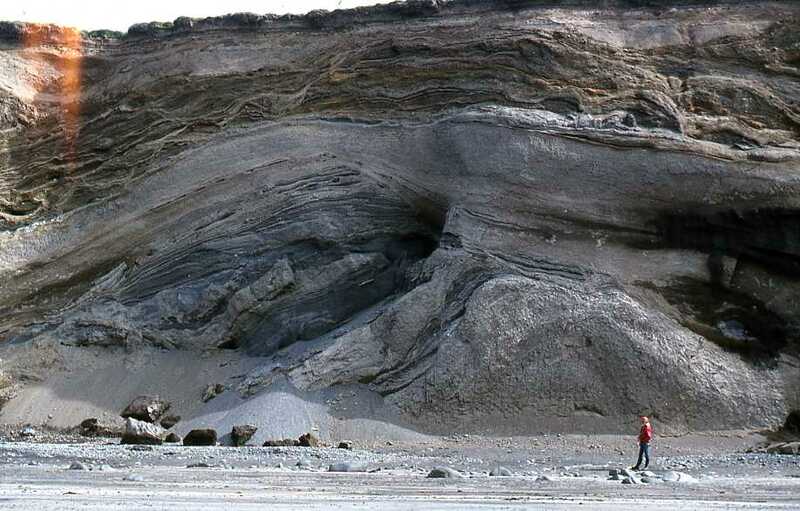 However, the apparent shape of a fold may be distorted by the angle of erosional exposure relative to the fold axis (image at left). ├ .. On geological maps, the stike and dip of bedding, rather than axes and folds, are indicated. 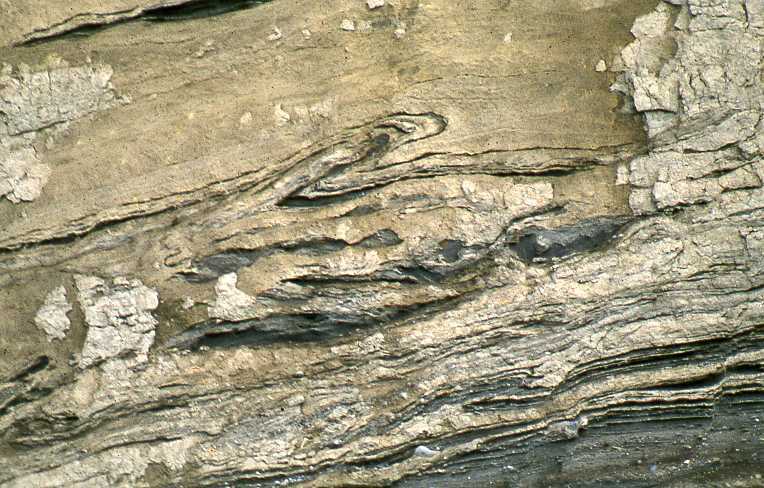 Geological folding involves the plastic deformation (bending, buckling) of a single or multiple (stack) strata, such as sediments and rocks, which were originally planar horizontal surfaces. Although even brittle rocks may undergo plastic deformation when stresses are applied over considerable periods of time (low strain rate). Beyond plastic deformation, rocks fail structurally and faulting occurs. 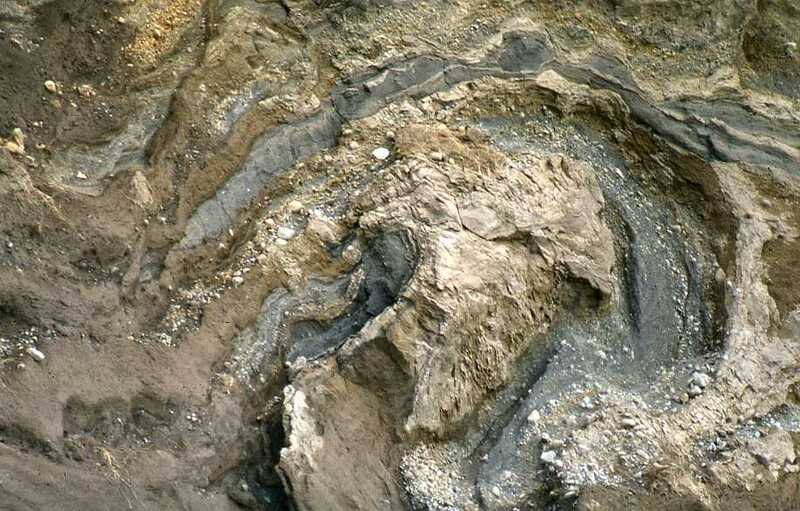 Folds may be isolated or may occur in extensive fold trains, and folding may range from the microscopic scale to mountain-sized folds in orogenic belts. Folds are classified according to size, fold shape, tightness, and dip of the axial plane. Folding can occur by flexural slip, buckling, or mass displacement under under varying conditions of stress, hydrostatic pressure, pore pressure, and temperature. Fractional crystallization (fractionation) is that process of magmatic differentiation that accompanies the failure of early-forming crystals to react to the melt that remains. The process of fractional crystallization is responsible for the bulk of differentiation that is occurs in igneous rocks. 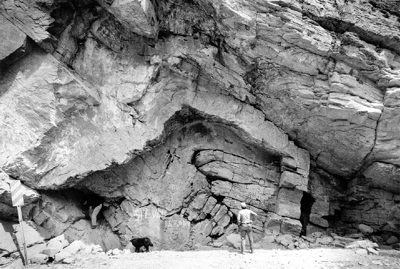 As ascending melts cool and react with country rock, those minerals in the melt that have the highest melting points or the lowest solubilities (quick-freezing refractories, like olivine and pyroxene) crystallize out first, leaving minerals with the lowest melting points or solubilities (quick-melting fusibles, like silica) behind in the melt to freeze out last. Latent heat associated with phase change is released by the crystallization of refractories, replacing heat lost by conduction to the surrounding country rocks, lost to melting of country rock, and lost to the assimilation of fusibles in the country rock. Fusibles enter and refractories leave the melt at characteristic temperatures and pressures, and these exchanges tend to occur at specific depths along the ascent. The remaining melt loses volume as it rises, rendering its fusibles increasingly concentrated. Thus, exchanges within ascending magma leave behind a trail of solid refractories and country rock alterations. Gravitative differentiation is the commonest form of fractionation, and results from the phenomenon that most solid minerals are denser than their parent melts. As denser crystals settle to the bottom of the magma body, they become segregated from the residual melt. 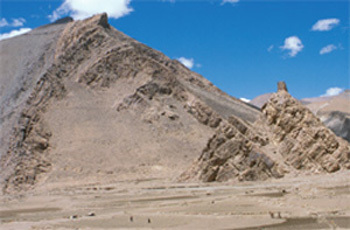 Rocks that are formed by settling crystals are termed cumulates, and the rocks are often zoned, with the densest, first-formed crystals accumulated at the base of the magma chamber. Cumulates formed by the lighter crystals occasionally float to the top, with the lightest at the very top. 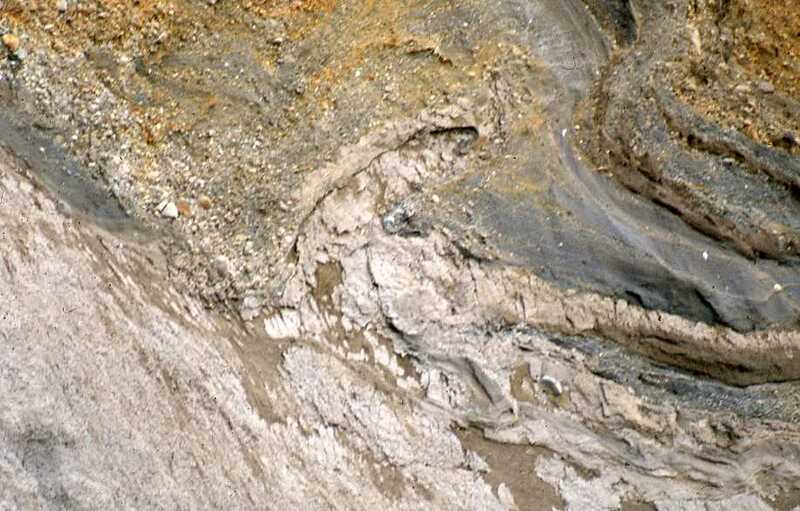 This process produces layering in igneous rocks. The crystals of cumulate rocks are typically cemented by residual magmatic fluids. Fusibles are rocks or minerals that melt easily, and are the opposite of melting-resistant refractories. Sedimentary rocks, which are stable at the Earth's cool surface, tend to be fusible because they consist mostly of stable minerals that have resisted weathering. Crystalline rocks tend to be refractory and to resist melting because they consist mostly of minerals that crystallized out of melts. 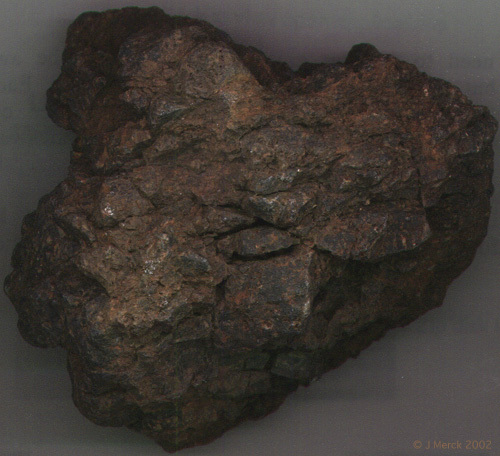 The most refractory rocks, such as gabbro and peridotite, are stable in the lower crust and the mantle.